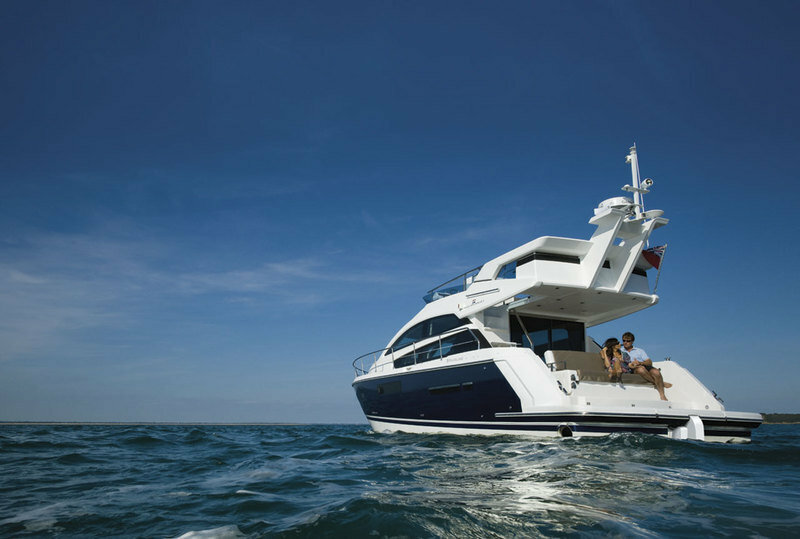 Since its founding in the 1960s, Fairline has built over 13,000 boats. For the Squadron 42, the Fairlane design team provided the layout and details, while the engineering and naval architecture came from the design firm Bernarad Olesinski — Naval Architects, known for their outstanding design work in the rarified world of megayachts. Overall, Fairlane’s Squadron 42 is just that: 42 feet of megayacht. 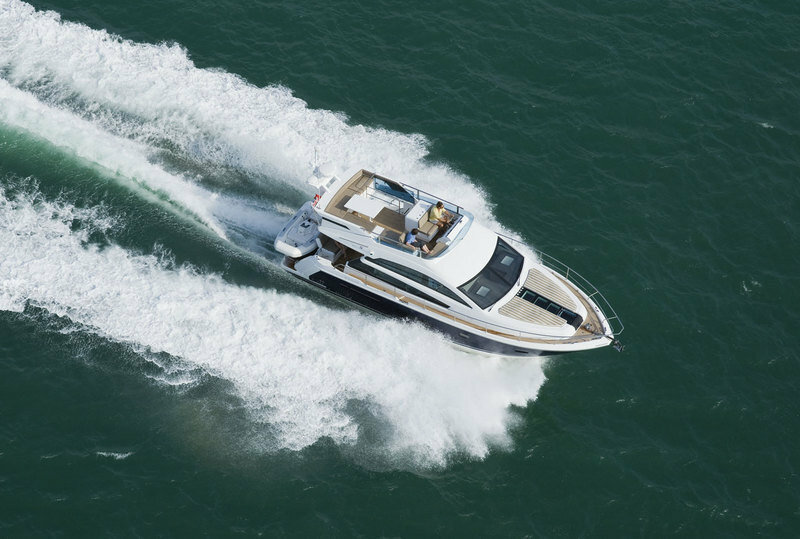 The smallest of the Squadron series, the Squadron 42 can accommodate up to six persons in an environment that reminds you of nothing so much as a very plush, airy loft that can zip along at up to 30 knots. The Fairlane Squadron 42 has a sturdy hull made from an isophthalic gelcoat over an isophthalic resin-rich powder-bound glass mat. This combination deters hull blistering. The hull characteristics begin with a deep-V forward that becomes more rounded as you move aft, ending with sides that slope downward to the water at a 12.5 degree angle. The hull is further strengthened by transverse frames and longitudinal stringers. It has spray deflectors along the length of its hull and an antifouling coating on the bottom. The integral swim platform gives the hull a longer waterline for improved low-speed performance. Two Volvo Penta diesels drive stainless steel propellers mounted in semi-tunnels can push the Squadron 42 to a top speed of between 28 and 30 knots. The deck hardware and systems include stainless steel cleats, fairleads, an electric anchor winch and a calibrated anchor chain feeding into an integral chain locker. The anchor rode consists of a 35 lb. Delta anchor and 148 feet of galvanized steel anchor chain. The vessel’s electrical system utilizes a single battery as a starter battery. Dual, parallel-wired batteries provide 24V and 12V power to control systems, and a power inverter provides 240V service where needed. Shore power connections to the vessel’s main electrical panel can provide you with power when the Squadron 42 is docked. At the main helm, you have more than the good looks of the Squadron 42’s random-pattern teak floor; you have a full set of instruments, from tachometers, temperature, and fuel gauges, to battery-condition gauges, engine hour meters and audible alarms for both engines, as well. The steering wheel that controls the hydraulic steering tilts to accommodate you as you sit in the bolstered helm seat. From the captain’s chair, you can control the electrical circuits, the bilge pump and fire extinguisher system. You use the single-lever throttle control to set engine speed and the gear controls to set the direction in which the engine’s power is applied to both the port and starboard engines, a system that may be unusual at first, but is easy to work with after a few uses. The standard navigational suite is somewhat impressive, but lacks radar, although a radar mast is provided. You have control of the winches and searchlights, as well as control of the trim tabs. It does include a high-speed magnetic compass, Garmin’s GMI 20 multifunction instrument to relay wind speed, water depth and temperature and other information about the environment, and the Garmin VHF 300i marine radio that provides AIS data – Automatic Identification System – to other vessels and authorized shore stations. The AIS data allows your boat to be tracked worldwide by satellite, to assist you in port operations. As every captain knows, at night, a dark wheelhouse is a happy wheelhouse; therefore, you have red illumination at the helm to prevent the temporary night blindness that occurs when using standard illumination to read charts, a touch not often seen in yachts of this size. On the flybridge deck, you’ll find a lighter mood. You have weatherproof repeaters for all of the major instruments, a second compass, the same single-lever throttle control and dual gear controls, the same vessel controls and a rudder position indicator to assist you with docking operations. You have a standard VHF radio that incorporates an intercom, so you can communicate with those down below. Rather than teak, the deck is a molded, non-skid surface. As you first board the Squadron 42, you’ll notice its hydraulic gangway. It has a tender-launch system as well. You’ll note the expanse of glass; the boat’s interior is divided into an upper and lower deck. The open interior architecture leaves both flooded with light from the windows. From the main salon, with its flat-screen television, dining table and sideboard that doubles as an entertainment center, you go down three steps to the lower deck that houses the galley, the guest quarters and the master cabin. On the lower deck, the well-equipped galley is to port and the guest cabin is to starboard. The guest cabin has two bunks – which can be joined to form a double berth – ample storage and closet space. Adjacent to the guest cabin is a head with shower. The master cabin is forward of the galley. 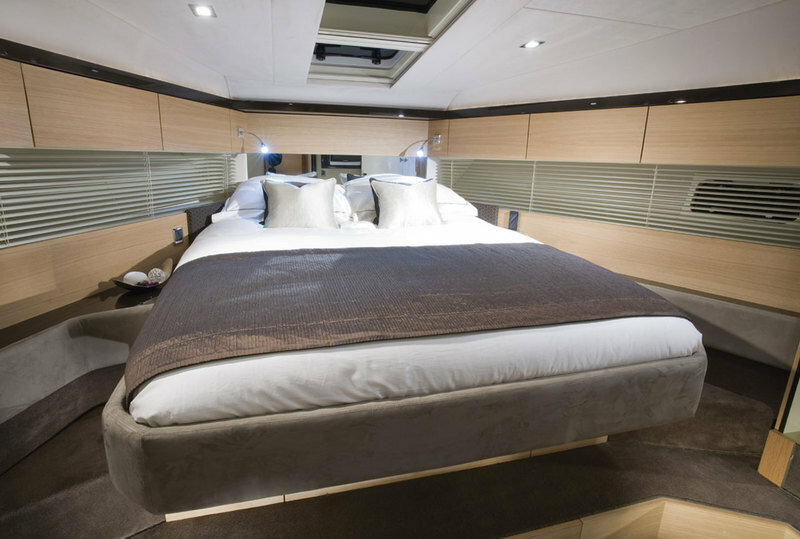 It has a queen-size berth and a closet with full-length mirror, under-bed storage and overhead lockers. Reading lights as well as overhead lighting, light from the windows, which are covered with venetian blinds, and light from the skylights leave the master cabin bright and cheery. The en suite head is complete with shower. Go back through the main salon and onto the main deck and you can step down to the swim platform and its convertible rear-facing seat that doubles as a bench seat at the rear of the main deck, facing into the salon. Go up from the main salon and you arrive in the flybridge with a lounge seating along its starboard and aft sides. You have a companion seat at the helm, drink holders, a bar, refrigerator with icemaker, a table and a weatherproof, 12V outlet for your stereo. A barbecue grill for the flybridge is optional. • It’s a tough boat. Two layers of gelcoat is brushed into the mold. The fiberglass fabric alternates: a layer of unidirectional fiberglass fabric is laid in first, followed by a biaxial layer, then a woven layer. The pattern then repeats and is hand-laid. The resin is isophthalic resin that resists osmosis and blisters. A liner is bolted to the hull after that. The engine stringers strengthen the bottom of the hull. The whole boat, with its heavy-duty hull, its longitudinal and transverse supports and its bonded, bolted deck that’s stiffened by the polyurethane foam, disperses the stresses of the sea, rather than the hull alone. •	The open hull plan is flooded with light from the windows and skylights. •	The Fairlane Squadron 42 is pricey. The asking price for a used 2013 Squadron 42 is $672,810. •	It lacks watertight doors. Sliding glass doors protect the interior from spray, but the Squadron 42’s open architecture and the lack of a watertight barrier to close off the interior means you need to keep the Squadron 42 out of heavy seas. •	Radar isn’t part of the boat’s standard equipment. Fairlane has built first-rate yachts since 1967. 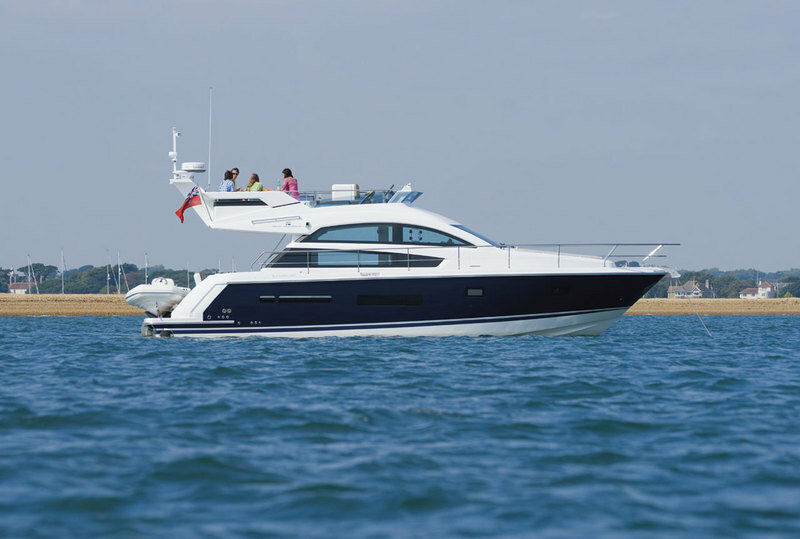 The Fairlane Squadron 42 is probably the highest-priced 42-footer on the market. As anyone who’s ever owned any high-end product knows, quality costs, but as anyone who’s ever owned a high-end product also knows, it pays to shop around. 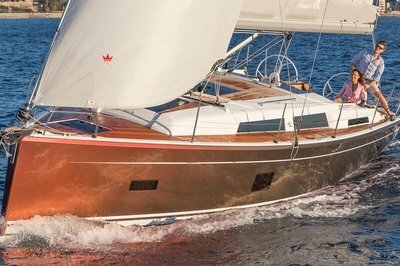 Do so before you inspect the Squadron 42, lest you judge other yachts by its quality.